Tree fertilization can be performed in numerous ways and goes by a number of names. Sometimes called “deep root feeding”, this term is incorrect for a couple of reasons, and is a good clue that someone calling it that has a poor understanding of tree care. Trees produce their own food, as you may recall from 6th grade biology, creating sugar through photosynthesis. When we fertilize trees we are not giving them sugar but instead providing essential elements that they require to create various cell structures and perform various functions essential to survival. These elements are often referred to as “nutrients”, which could explain how the term feeding came into use. There are 17 of these elements (including carbon, hydrogen and oxygen), but I am only going to focus on a few. If you were to buy a bag or bottle of fertilizer, you would see three numbers on it. This is referred to as the analysis, with the numbers representing nitrogen, phosphorus and potassium (N-P-K) in that order. These are the three so-called “macronutrients” that the tree uses in larger numbers than most of the other 17 and are most commonly deficient across a wide spectrum of soils, so these are the ones most commonly applied when fertilizing not just trees but most plants. It is important to remember however, that these three may not be deficient in your soil. For instance, in the Austin area, P and K are often “off the charts” in terms of how high an amount is present in our soils. Adding too much of any element can be toxic, often by making the tree unable to take up other elements. Phosphorus is a good example of that, and it can also be harmful to beneficial microbes. This is why I often recommend that a soil analysis be done to see what elements, if any, are needed. I emphasize “if any” for an important reason. Many tree services promote fertilizing services that are totally unnecessary, encouraging customers to sign up for annual fertilization. At Arbor Vitae Tree Care, trees are only fertilized when deficiency is known or strongly suspected. Clients are never signed up for routine or annual fertilization. Nitrogen is commonly deficient in Austin area soils, as it is in many places around the world. How can this be, if our air is almost 80% nitrogen? The short answer is because most trees cannot absorb nitrogen in its gaseous state (certain trees have bacteria in their roots that can). And since nitrogen converts into a gas quite readily from the ground surface, and leaches out of the root zone with rainfall and irrigation, there is often little of it present in the root zone in a state in which trees can absorb it. Add to that the fact that in most residential areas plant litter like leaves and lawn clippings are often removed on a regular basis. 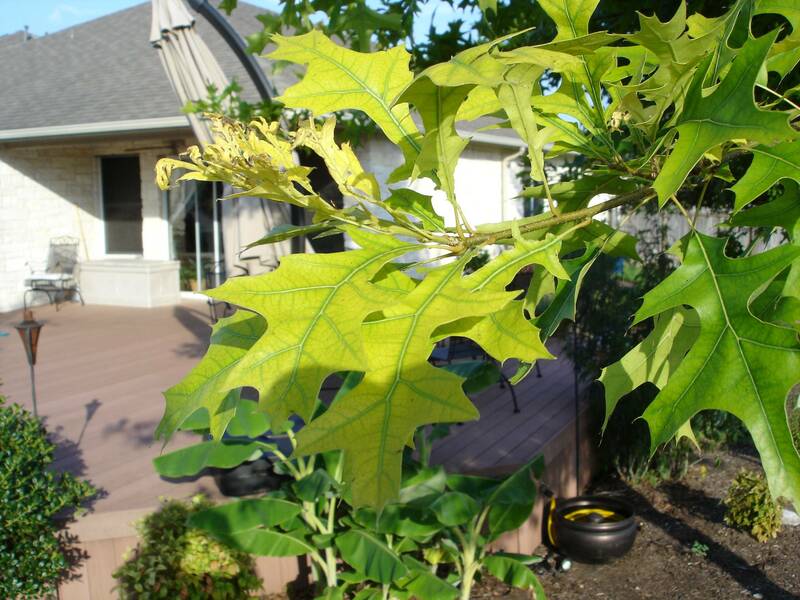 This practice breaks the “nutrient cycle” and is one of the most detrimental things you can do to your trees. This litter contains many essential elements and also adds vital structure to the soil. Nitrogen deficiency often appears as an abnormal paleness or yellowing of the entire leaf, with this discoloration first appearing on the older (inner) leaves. Often the leaf is undersize as well. Another common deficiency in our area is iron (photo). Curiously, this is not because iron is deficient in our soils, but because of our soil’s pH. A soils’ pH is a measure of how acid or alkaline it is, and because of the great amount of limestone (calcium) in Austin soil’s our pH is often around 8, which is very high. Just as an acidic (low pH) soil can make some elements unavailable in plants, so to can a high pH, and iron is one of the elements most commonly affected in this way. This also means that an iron deficiency may not be revealed by a soil analysis. Foliar analysis is sometimes used in this case. As I mentioned at the start of this blog, there are numerous ways to introduce elements into a tree’s system, from spreading it on the ground to injecting into the trunk, to spraying it on the leaves. Both of those techniques have their place, but I’d say that place is limited, as they both have significant drawbacks as well. If a tree service recommends one of those techniques, be wary, and find out what their justification is. The technique I find best involves injecting a customized blend of elements and compounds with proven soil and microbe benefits below the surface. But contrary to popular belief, most of a tree’s absorbing roots are fairly close to the surface. If someone is recommending “deep root” fertilizing, meaning more than a foot deep, they are probably bypassing the vast majority of the tree’s root system, and the product you paid so much for is just polluting our aquifer. That is another thing to consider when fertilizing. If applied excessively, improperly or in the wrong form, the risk of polluting our aquifer is very high. This is because of the fact that most of Austin is sitting on a giant block of limestone swiss cheese (called “karst”). If you purchase a fertilization service based on price, you may be getting a poor quality fertilizer. These are often high in salt (which can harm your trees in a drought or if over-applied) and/or are highly soluble, which means they leach into the aquifer faster and more completely than a higher quality one. Always ask what kind of fertilizer a service is using. A competent arborist will give you a thorough explanation. The blend I use is specifically intended to be retained by the soil rather than leaching through it or vaporizing. I’m posting this in the spring because people often ask what time of year to fertilize. Research has indicated benefits to fertilizing in either spring or fall, and avoiding the hottest and coldest months. That is my recommendation. Depending on what species I am fertilizing and what the deficiency is, I will tailor the timing as needed. The subject of tree fertilizing would take a book to thoroughly address. These are just a few of the things a competent Certified Arborist would consider before proposing the service for you. Call me today for a consultation. 512-301-8700.